In Florida and California, XBRL is set to become a requirement for annual filing of your CAFR. If you are a finance officer in government, the term XBRL may be new to you. If you work in the finance department of a publicly traded corporation, you may have some familiarity with the term. This article answers the 5 biggest questions about XBRL for those in finance that will be required to utilize it and for those who have been required to file in XBRL but may not know a lot about the technology. eXtensible Business Reporting Language (XBRL) was created by CPA Charlie Hoffman in 1998 as a way to transform business reporting. Sometimes referred to as "bar-codes for reporting," XBRL allows the facts which appear in a report to be "tagged" with a name which is centrally defined and managed. Those facts and tags can then be used to represent the contents of financial statements or other kinds of compliance, performance and business reports. In a typical finance department XBRL may be used to create, analyze and exchange financial reporting information including financial statements, general ledger information, and audit schedules. This allows XBRL encoded reports (called Instance documents) to be machine-readable. Inline XBRL (iXBRL) is a development designed to render the data in a visually appealing format. iXBRL takes the same data as an XBRL report and embeds it into an HTML document that can be viewed in a web browser. In other words, it is a way of tagging reports making them readable to both humans and machines. Since 2006 XBRL International has operated as the not-for-profit organization to "develop specifications to support the collection, sharing and use of structured data for data reporting and analysis". 2) Where is it used/required ? Passed into law in 2014, the Digital Accountability and Transparency Act (DATA Act) is a law that aims to make information on federal expenditures more easily accessible and transparent. It mandates that federal agencies report to U.S. Treasury using XBRL. More recently, the State of Florida is finalizing legislation that requires financial statements be filed in XBRL and meet the validation requirements of the relevant taxonomy. This will affect more than 400 Municipalities, all of which produce CAFR's today. This is set to begin for fiscal years ending on or after September 1, 2022. The State of Florida is likely to be just the first of many who adopt this legislation for greater reporting transparency. California introduced the Open Financial Statement Act, SB-598, in late February 2019. The proposed legislation would replace both the current State Controllers Office (SCO) report and the current PDF CAFR with iXBRL statements. 3) Why is it used? Currently, government departments submit their financial reports in a somewhat ad-hoc way within stated guidelines (CAFR/PSAB/OCBOA). The ability to compare and analyze how varying governments operate is essential to good decision-making and community planning. Aggregating and comparing the data from these reports from one organization to the next however can take countless hours. Even then, the flexible nature (professional judgement) of these reports can inhibit direct comparison. To better aggregate on an comparable basis, some states/provinces have attempted to solve the challenge more locally by requiring submission of another report (SCO in California / AFR in Florida / MFIR in Alberta / FIR in Ontario/ LGDE in British Columbia ). These reports can be directly compared and analyzed, but require lots of manual work both by local government to populate and the state/province to aggregate and analyse. This is what drives the requirement for financial information to be submitted in XBRL. It allows for standardized, apples-to-apples aggregation, analysis and comparisons by computers across multiple entities based on an industry-recognized standard. 4) How do I apply it to my CAFR? Some government finance departments use report automation software that enables generating iXBRL tagged reports. If this is your finance department, that's good news, as preparing reports in iXBRL format may be as simple as assigning tags to your documents. Higher annual fees were due to complexities in their financial statements and rush charges imposed given the many last minute changes to the filings. Given the above numbers relate to small companies, we expect that fees for a government encoding a large, complex CAFR would be on the very high end of this range. 5) When should I start working on this? The short answer is as soon as possible. If your current system supports iXBRL, begin planning to tag your CAFR with the appropriate XBRL taxonomy within the next year or so. If your current system is spreadsheet-based, you have a longer road to travel. We recommend you start by implementing a solution that automates your reporting AND allows for tagging your CAFR. 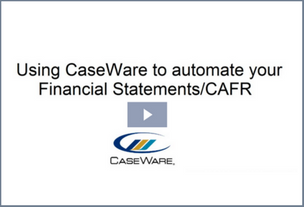 You will benefit immediately from reduced workload and fewer errors in your CAFR. Then when XBRL reporting begins, you save again by avoiding 3rd party tagging fees. These savings alone could easily cover the cost of the reporting automation software.